In this Ulric Build Guide, we provide an overview of his strengths, abilities, Battlerites and matchups. Ulric is the sort of Champion I’ve been waiting for. Not just because of his angelic, holy priest aesthetic, but the fact that he’s the first melee Support that’s almost entirely defensive. Where the likes of Poloma or Pestilus are more than capable of dealing consistently solid damage, Ulric is a little more limited. His predominantly melee playstyle sees him not only play incredibly close to his teammates, but his key ability and its bonus (Favor) only works when he interacts with an ally. Sworn protector of the weak, devout follower of the Way of Symphony, and unwavering light against the dark. Ulric, trained in the holy Monastery of Resonance, has spent many years traveling the lands to spread the word of the Light. He joins the Arena now to demonstrate to allies, foes, and onlookers alike the primacy of the True Path. Although Ulric has access to a ranged attack (Smite), when this is activated he’s unable to heal until his charges have been exhausted. Even with this limited means of poke, Ulric’s potency is in his ability to not only protect his teammates with ease, but also mitigate high amounts of damage for them. Effectively, Ulric is repeatedly capable of not only applying Favor, but also blocking multiple attacks, while offering high healing and shielding. The one downside to Ulric (if there is any) is that if he wastes Intervene and Radiant Shield, he can find himself focused and killed incredibly quickly. Missing his stun on Hammer of Justice is also particularly punishing, and can see him shut down by a well timed Ultimate. Hammer of Justice (LMB) - Ulric’s primary attack deals low damage, but allows him to stun opponents once it’s charged. 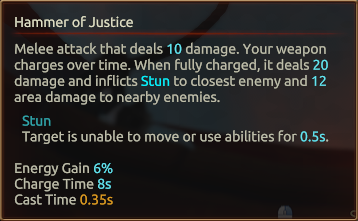 It takes 8 seconds to charge, deals significantly higher damage when it is, and also cleaves those around Ulric. Ideally, you want to preserve your charged weapon for protecting an ally or yourself, or for a quick burst against an opponent (Intervene > Hammer of Justice can deal 32 damage instantly). It’s also worth saving your stun in the event an opponent has their Ultimate ability, as the likes of Shifu will tend to save theirs for when you’ve few means of defending yourself. Holy Light (RMB) - With a relatively large radius and healing for a high amount (with no heal over time component) Holy Light has 3 charges and doesn’t require line of sight. As your primary means of keeping yourself and your team alive, it’s important to ensure you land Holy Light, but also don’t waste it. If your teammate has took only a tiny amount of damage, don’t automatically rush to top them up, as future burst damage against them might require back to back heals. That said, healing your team when they have Favor is much more efficient, as you'll heal for significantly more. Intervene (Space) - Intervene is an incredibly important ability for Ulric and one with considerable depth. As his only form of mobility, it’s also also the only means of applying his strongest buff: Favor. 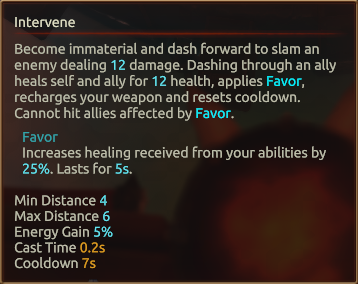 Hitting an ally with Intervene not only applies this buff, but also heals them and you for 12 health, recharges your weapon and resets the cooldown of Intervene. 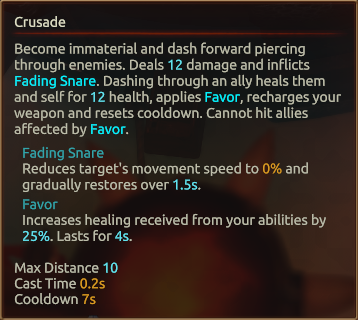 Where Favor is concerned, this buff increases all your healing output by 40% for its duration, with Favor lasting a set amount of time (it cannot be reapplied until it expires). Unsurprisingly and due to the diversity of this ability, there’s a great deal of utility and value in it. In 3 versus 3, you can use the reset to hit one ally, and bounce immediately to another for a double-dose of Favor. Alternatively, you can hit an ally and then dive onto an enemy with a recharged weapon for a burst of damage. 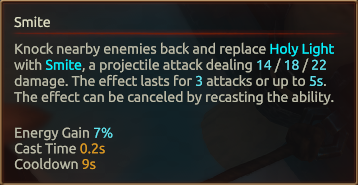 Finally, you can simply use Intervene to kite and escape, with the reset offering Ulric considerable mobility as long as he tags an ally first. 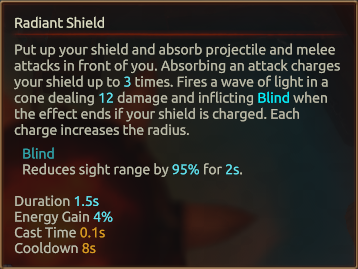 Radiant Shield (Q) - Acting similarly to Bakko’s Bulwark, Radiant Shield provides complete mitigation for its duration. Unlike Bulwark however, Radiant Shield stores attacks and releases these back as one, or multiple projectiles that blind. Simply put, the more attacks Radiant Shield absorbs, the greater the number of projectiles Ulric will release, with the radius also increasing per absorbed attack. Smite (E) - Smite is Ulric’s ranged attack and allows him to use Holy Light to fire projectiles which deal damage, instead of healing. Each of the projectiles fired is quick, and deals increasing damage. What’s important to remember is that you cannot heal while Smite is active, so will have to use all your charges, or cancel the ability by using it again. If you can, try to ensure you don’t trigger counters with Smite, and use the last charge to burst the central Orb for a steal. Condemn (R) - Allowing Ulric to place a single player into stasis, Condemn has a short range and fairly lengthy cooldown. Dealing minor damage, its primary value is removing one Champion from play, whether that’s to punish their teammate or to protect yourself. If you can, try to gain enough Energy to cast Condemn as quickly as possible as it’s often your only means of defence once Intervene is on cooldown. Crusade (Shift + Space) - Crusade is a sexxed up version of Intervene, and allows Ulric to charge an incredible distance while slowing anyone he touches. Not only that, but he can pass through all allies and enemies, meaning if he’s being body-blocked, he can guarantee his own escape. For reaching a teammate who’s out of position, diving a low health enemy who thinks they’re safe, or generally getting out of the way. Sanctuary (Shift + Q) - Sanctuary is an incredibly strong ability, as it allows Ulric to provide instant AOE healing as well as shielding. 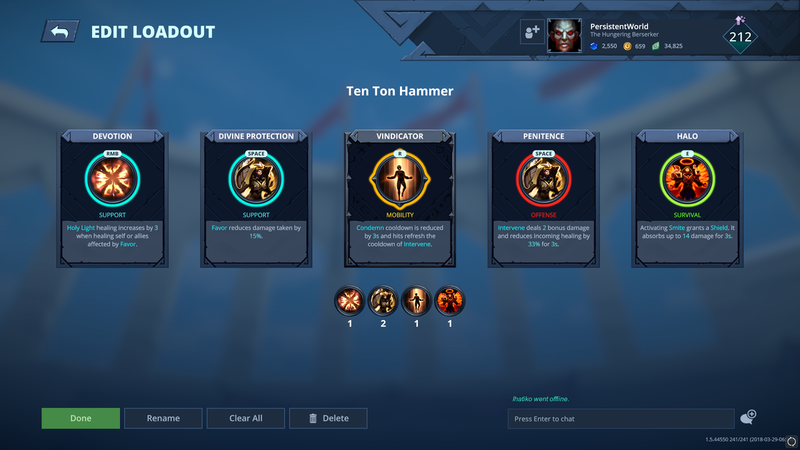 The double dose of health and shielding allows him to mitigate incoming damage, top his team’s health up, while still having Intervene available. Although it consumes the same cooldown as Radiant Shield, leaving you vulnerable to ranged attacks, it’s great when under immediate pressure from all sides, or when backing off. Aegis of Valor (F) - Aegis of Valor is a potent Ultimate ability, but it’s also one that’s predictable. It has a loud audio cue, and long wind time, meaning that most Champions can avoid or deflect it if they anticipate it. 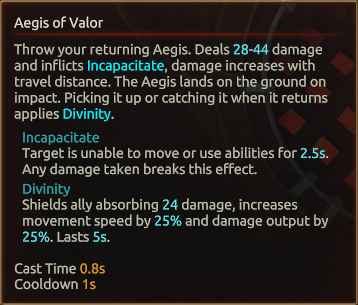 Ideally you want to use Aegis of Valor from maximum range, for maximum damage, but to also use it when an opponent has used their defensive abilities. It’s also worth ensuring you have a charged weapon and Intervene ready, so that when you do stun an opponent, you can quickly fly towards them for a one-two punch. Devotion allows Ulric to heal for 3 additional health when healing those affected by Favor. What's not readily apparent is the fact your Favor buff (increasing healing by 40%) works with the +3, meaning your 14 base, +3 from Devotion actually becomes +22 healing. Whether or not this intentional, it allows Ulric deliver ridiculous amounts of healing. Likely to be nerfed, Divine Protection is undoubtedly one of the strongest Battlerites in the game. Granting a 15% damage reduction to any ally with Favor (including yourself), it allows Ulric and his team to withstand significantly more damage when Favor is active. Considering Intervene can be re-cast on its first application, you can comfortably maintain the buff across 2 additional team members. Lowering the cooldown of Condemn by 3 seconds, the value in Vindicator is in the Intervene reset. When you place an enemy into stasis, you'll instantly gain an Intervene charge, allowing you to zip away or trigger Favor on yourself and an ally for an instant shot of healing and damage reduction. Building on Divine Protection, Penitence increases the damage of Intervene but also ensures anyone struck by it has their healing reduced by 33% for 3 seconds. This is huge, and allows Ulric to apply one stack of Favor to allies, before using the second charge to dive an enemy - ideally with his team - for maximum pressure. Granting Ulric with a shield when he activates Smite, Halo buys him additional time and coupled with the knockback, makes him that bit tougher to bring down. It's great for mitigating a skill shot that might normally kill you, if you just quickly activate the ability. These Hero Threat Levels (1 being lowest threat and 10 being highest threat) are to help you determine which enemy Heroes can give you a headache. For the Heroes listed here, take extra care as they're particularly dangerous for Ulric. 1. Don't waste your charged weapon. Use it to defend an ally, protect yourself, or to burst an opponent alongside Intervene. 2. Always hold onto your charged weapon if you suspect the enemy has an Ultimate or two. Shutting down key Ultimate abilities is pivotal to surviving. 3. Remember that your charged weapon will cleave nearby enemies for damage. If you can, use Intervene to dive a group and hit more than one with your Hammer of Justice. 4. Holy Light deals burst healing, and offers no healing over time. With only three charges, use it to ensure true health isn't lost. 5. 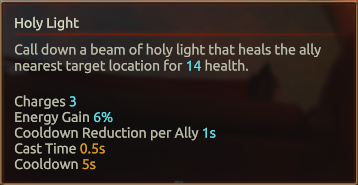 Holy Light heals for a huge amount when an ally or yourself are affected by Favor. This allows you to heal less, and keep players alive who have taken burst damage. 6. Intervene has many uses, but first and foremost you should be prioritising applying Favor on your teammates. It means they and you take less damage, resulting in you having to heal fewer times. 7. Ideally, try to apply Intervene once and then use the ability reset to dive for an application of Penitence, or to reposition away from the enemy. Only dive if you've a charged weapon, and retreat if your team need protection. 8. If you time it right, and even in 2 v 2, you can use both charges of Intervene to apply two charges of Favor. As the first application is about to expire, use your reset. It takes practice, but if you time it correctly you'll maintain the buff for a considerable period of time. 9. Don't forget that Intervene makes you immaterial to allies, allowing you to pass through them. Only Condemn (the EX version) allows you to pierce through enemies. 10. Radiant Shield can mitigate all damage in front of Ulric as long as it's active. Use it to avoid high impact damage, rather than a couple of basics. 11. Your shield will automatically release projectiles that cause blind once it expires. This can trigger counters. Be sure to turn away to prevent it. 12. If you've stacked up some blinds from Radiant Shield, always point them to an ally who's in trouble. It'll buy them significant time to move, or deal damage freely. 13. Smite is great for poking, but you must learnt to cancel it if you need to heal. 14. 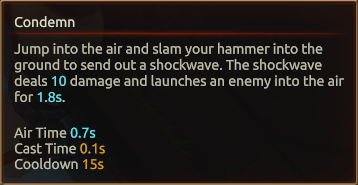 Remember that Smite causes a knockback on use, often creating enough space for you to reposition or escape. 15. Use Condemn to remove a Support from play, so that you and your team can deal damage to their teammates. 16. Use Crusade against Champions such as Zander who have lots of mobility. They'll think they've escaped you, yet Condemn allows you to travel right back at their feet. 17. Crusade is great for harrassing enemies who think there save. By all means use it to dive, but only if you've got Radiant Shield and/or Condemn available to escape. 18. Sanctuary is one of the best abilities in the game. Use it, and use it often.